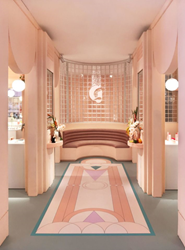 Now open, the Glossier Miami pop-up store features a colorful Art Deco design with large acrylic block wall panels custom-created by Hy-Lite. 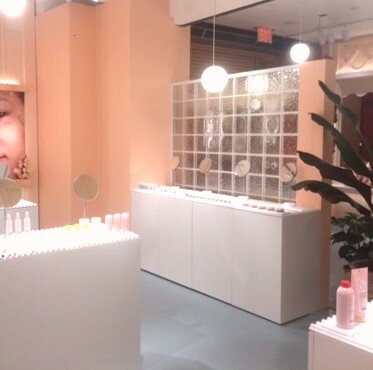 Glossier Miami pop-up store featuring Hy-Lite acrylic block wall panels. Lightweight and easy to install, our acrylic block panels are the perfect accent for the design of the Miami Glossier pop-up store. Hy-Lite, a U.S. Block Windows Company, is the leading manufacturer of acrylic block, glass block and decorative glass windows. The company's privacy product options include acrylic block shutters, accent panels, radius walls, partition walls and door inserts. Since 1988, the Pensacola, Florida-based company has been committed to providing residential and commercial construction professionals and homeowners with elegant, affordable privacy window designs. For more information, visit http://www.hy-lite.com.